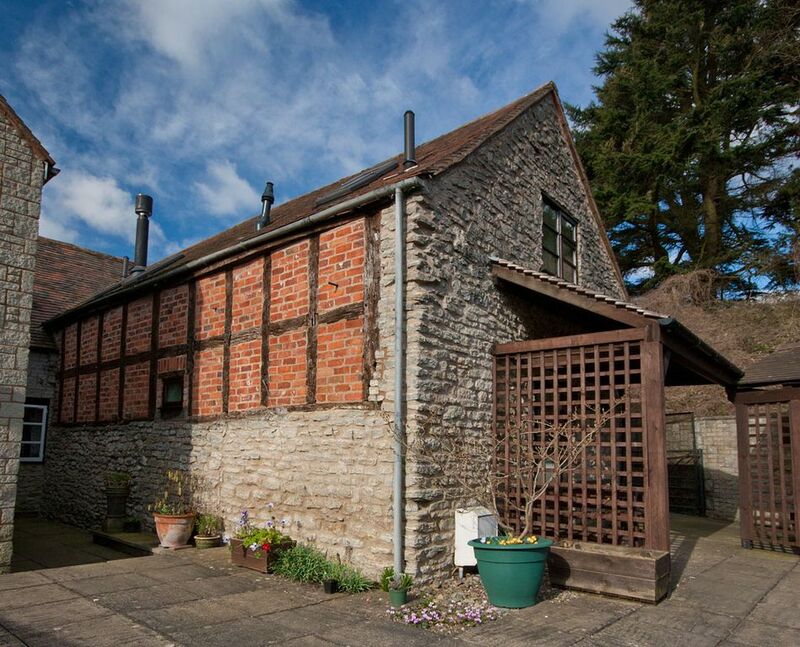 Situated in the heart of this small and quintessentially 'olde-English' town of Much Wenlock, 'End Barn' provides fine quality accommodation within an easy walk of the towns historic attractions. With numerous medieval buildings, pubs and restaurants, there's much to see and do before even wandering further afield to explore the rest of Shropshire. End Barn itself is a recently converted 17th Century barn and sleeps up to 3 people, perfect for a couple or small family. The property is entered from the side of the building where a private parking space allows for ease of unloading your luggage and keep the cars off-road in an otherwise popular tourist part of town, so there's never a worry about getting parked at anytime of the day. At the rear of the cottage, double french doors lead to the newly fitted kitchen and dining room. The kitchen is very well equipped with 4 ring gas burning hob, grill and oven. The matching kitchenwares include toaster, microwave, kettle and tea and coffee pots. Plus there's also washing machine for guests staying for longer holidays. The open plan dining room boasts views over the garden and to the field beyond. The hallway leads through to the lounge, with inglenook fireplace and an electric 'log burning stove' effect fire. The flatscreen TV comes with an integrated DVD player. Upstairs, the two bedrooms, one double and one single room, are both dressed with fine quality linen and complete with their own shower rooms. Outside, the garden is shared with the owners who live next door, which you are most welcome to enjoy at your leisure. Garden chairs are provided on your own small patio area for you to enjoy the most pleasant outlook. Much Wenlock has many places to dine out, with a variety of traditional English pubs, cafes and restaurants within walking distance from End Barn. Situated just a short 10 minute drive from the UNESCO World Heritage site of Ironbridge Gorge, End Barn is ideally located for exploring Shropshire. Home to a number of iconic castles and famous stately homes, Shropshire has much to offer with the county offering many historic places of interest. Walkers are spoiled for choice too with Wenlock Edge beginning from the town and thus from your own front door if you choose. Just a short 15 minute drive takes you further into The Shropshire Hills including the walker friendly town of Church Stretton. From here it's all-year-round walking country with The Stretton Hills and the ever popular Long Mynd – a whaleback ridge of multiple summits and valleys. Further afield The Stiperstones and south Shropshire hills provide endless routes for all abilities. For a rainy day, Telford Shopping Centre with it's many high street stores are all under one roof whilst for something a little more traditional, Shrewsbury, which is a 15 minute drive away offers a wide range of independent shops. Further afield, the market town of Ludlow with it's impressive castle which holds a variety of festivals, medieval buildings and Michelan star restaurants is a 40 minute drive away. There a couple of grocery stores in nearby Much Wenlock including a butchers. You'll also find a doctors and petrol filling station in Much Wenlock. Nearby Ironbridge also has small stores but can be much busier at weekends. Large supermarkets can be found in and around Telford town centre, just a 10-15 minute drive away. Brian and Gwen were very welcoming and were available if we needed them. The cottage was well maintained and fitted out. Much Wenlock was a lovely little town with a pubs and restaurants to eat in - many more coffee shops in the day. Very handy for visiting many of the sites in that area. Comfortable ideally placed holiday house. This was a most enjoyable holiday home. Very well located and welcoming. Vey clean and a fabulous garden which is a credit to the lovely owners. Clean, charming and very pleasant. Shows pride of ownership. Perfectly placed for exploring the village and the surrounding areas. Very highly recommended. The owners are fantastic. Everyone we encountered in the area was so pleasant and helpful. Possibly the loveliest cottage we have stayed in - so beautifully refurbished to the highest standard and full of character. The gardens are fabulous and the owners lovely. The village of Much Wenlock is idyllic and everyone very friendly. We will definitely be back! Much Wenock is a charming place to stay and visit with interesting architecture and a broad range of shops and facilities. We enjoyed an excellent meal in the Fox. The End Barn was a lovely cottage with a beautiful garden, we were given a warm welcome and the cottage was very comfortable.The cottage was clean and well maintained and was accurately described. I can fully recommend End Barn as a place to stay. Thank you for your kind words and we look forward to hopefully seeing you again in the future. The postcode for the property is TF13 6HU. start date and departure is 10am. The cottage has a shared driveway with No. 45 where owners Brian & Gwen Davies live. street, NOT either of the side entrances. or alternatively, contact us at ‘Simply Shropshire’ and we’ll endeavour to answer your questions. Rates are subject to change until reservation confirmed.